Elephant Kingdom is another one of Colchester Zoo’s most impressive enclosures. We have a unique concept which allows all of our elephant’s maximum sight, sound and physical contact and has specially designed night stalls, a roped off “safe area” and spacious indoor bull elephant quarters. Here at Colchester Zoo we have four elephants, we have one male and three females. All of our elephants can be viewed in their large outdoor paddock area, which has a pool area and a waterfall, which they tend to enjoy in the warmer months. We have two females that have close contact with our keepers and on selected times of day visitors can feed our gentle giants. Our Bull and other female have their own outside paddock. 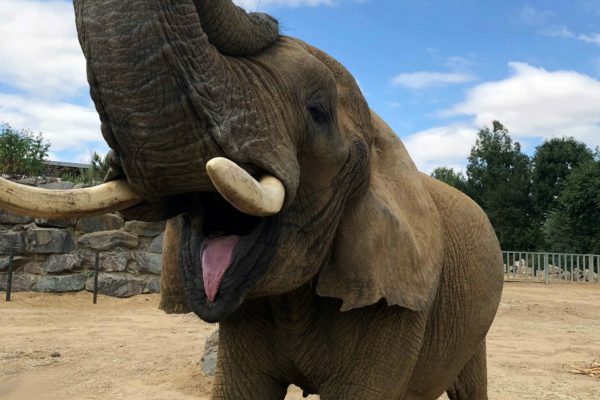 The African elephant is classified as Vulnerable on the IUCN Red List and Colchester Zoo’s charity Action for the Wild supports the Elephant Orphanage Project in Zambia, with its mission to rescue, rehabilitate and release orphaned elephants into protected reserves. The elephants they look after have become orphans due to the illegal ivory trade. Why not stop by their enclosure and watch our gentle giants or feed them at selected times of the day.